Behind the scenes of Take Me Cooking’s first cooking event. I first came to Buenos Aires 5 years ago, but I had to wait almost two months to be invited to the elusive Sunday family asado. The streets of Argentina’s capital are filled with parrillas, grill restaurants that specialize in grilled beef and various cuts of pork, chicken, and offal. 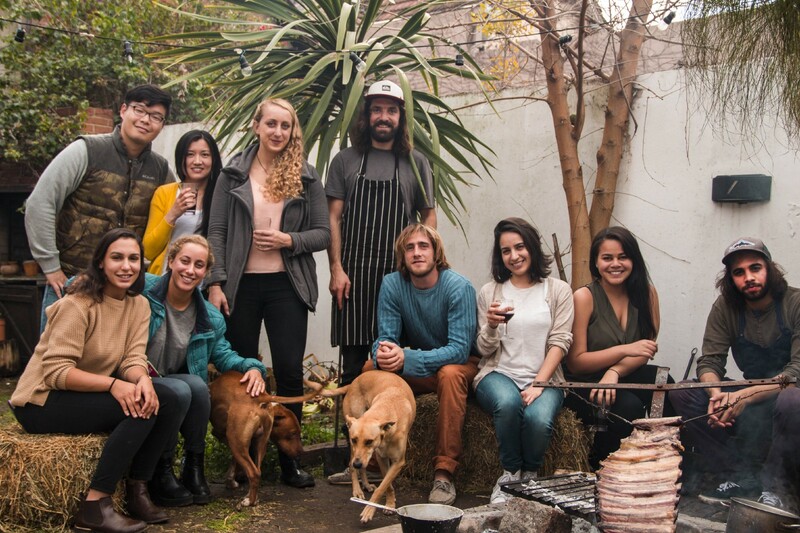 But a Sunday asado is special: getting invited means you’re part of the family. I took part in Take Me Cooking’s first Cooking Event last Sunday, along with six other curious cooks. 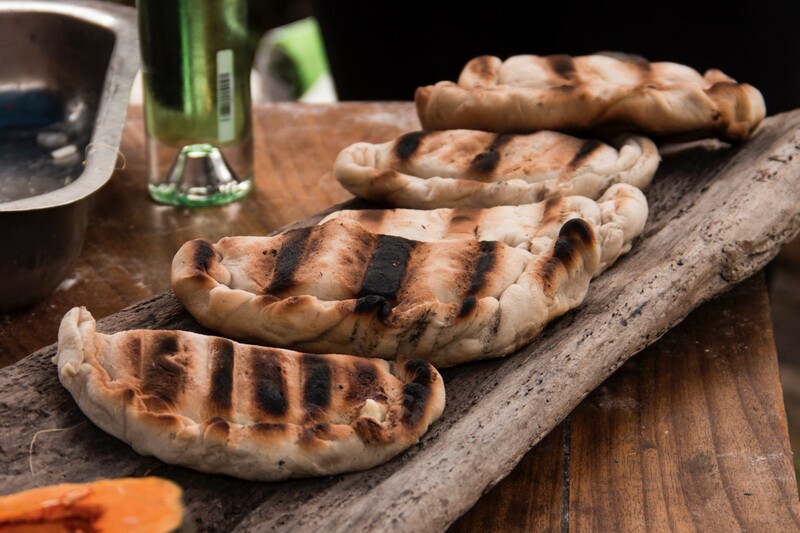 Many of my fellow guests were discovering the pleasures of an asado for the first time. 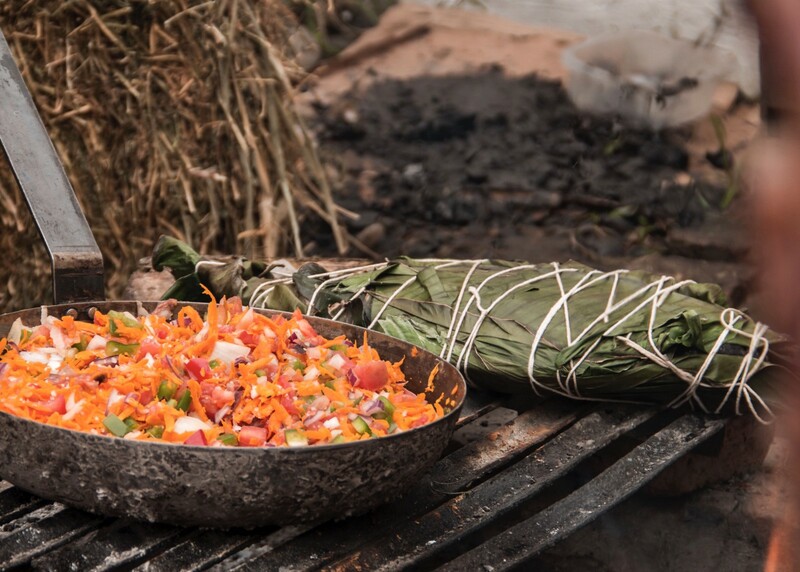 Asados often start around 11 or 12, but guests might not eat the main dish until a few hours later. Hours after the food is gone, guests stay around the table for the sobremesa to chat, chatting and nibble on tea time snacks and sip mate. Take Me Cooking’s first Cooking Event last Sunday felt like a real Argentine asado. The only difference was that I didn’t know our hosts or fellow guests until I arrived. 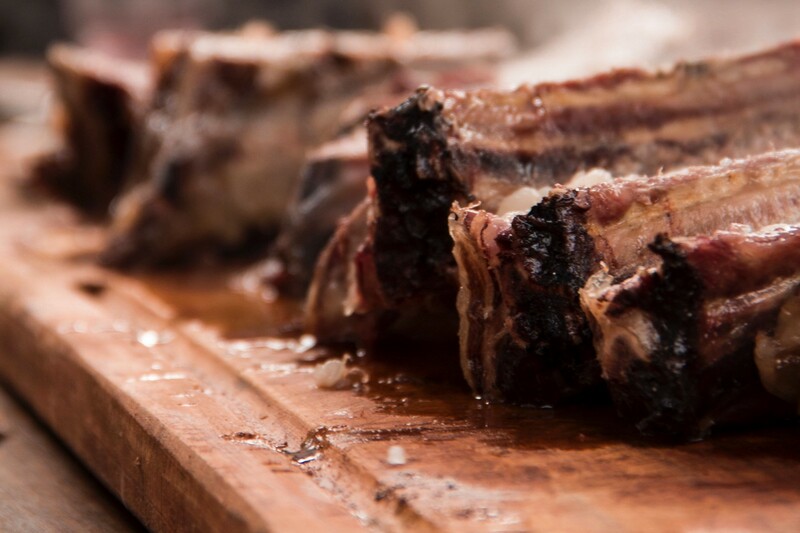 When I arrived at the event at a big home in the northern suburbs of Buenos Aires, our hosts Fran and Francisco led me into the grassy backyard and the main dish, a slab of asado, or beef ribs, was already roasting over a wood fire pit. 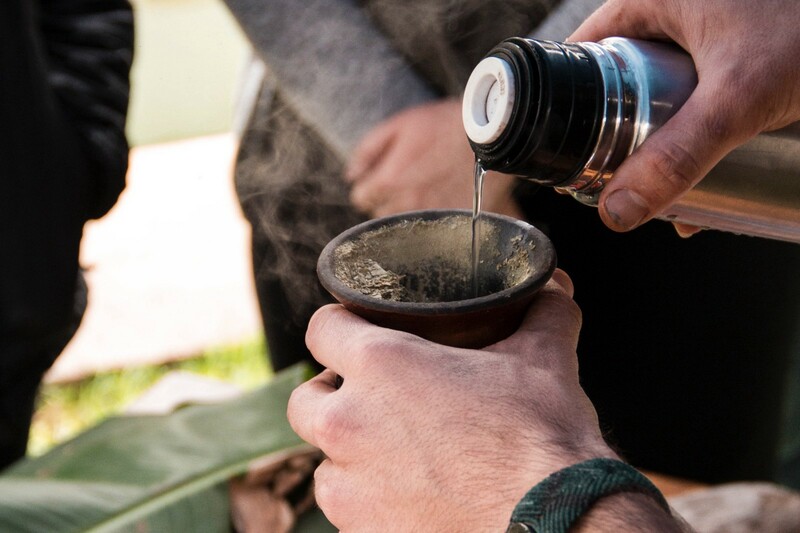 To begin the afternoon, our hosts gave us a quick mate tutorial, and pointed out important tips — like to never move the bombilla (metal straw) once it’s placed in the yerba (loose tea leaves). I’ve had mate a million times, but I still get intimidated if I have to be the cebadora (the person who serves the mate and passes it around the circle), so it was nice to review the basics: A single person (the cebador) pours the water into the mate, you must pass it back to the cebador when you have sipped all of the water, and don’t say gracias until you are done drinking — it signals that you don’t want any more. Guests who weren’t as familiar with the ritual of drinking mate appreciated the tutorial, and soon got into the rhythm of passing the gourd around the circle in between cooking preparations. This menu was inspired by Fran’s and Francisco’s travels to northern and eastern Argentina. I divided it into courses for ease of organization, but the meal we had was more of a slow, gradual process of preparing the food together and enjoying each dish as it came out of the fire. And as each dish came off of the fire, our hosts opened a fresh bottle of wine, which they had chosen to loosely accompany each of the flavors. 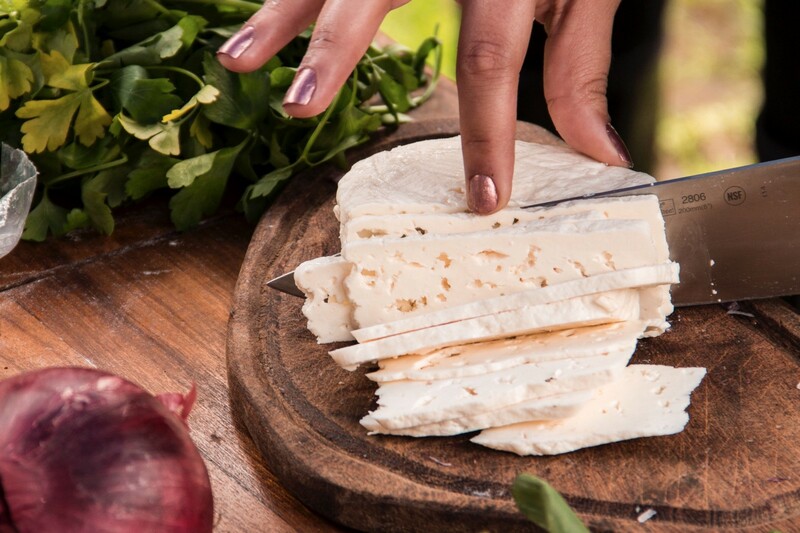 Appetizer: Northern Argentina-style tortillas with goat cheese and scallions. Accompanied by pebre, a spicy, vegetable-filled salsa. I added a tomato to my empanada-tortilla creation and then we each placed our tortilla over the fire. As our empanadas were toasting, we worked on pebre, an Andean salsa made with chopped tomatoes, onions, cilantro, sea salt, and spicy ají. 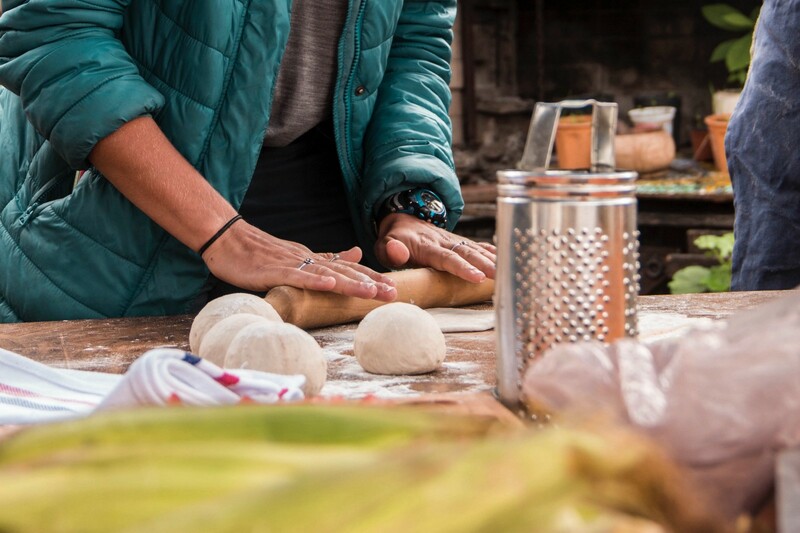 The best part of being a guest in this cooking experience? I could be exactly as involved in the cooking as I wanted — I could chop a few peppers, check the empanadas cooking over the wood fire, and then sit back and pass around the mate while I watched the other guests take over the cooking. When we cut the empanadas in half, melted goat cheese flowed out.We spooned on some pebre and uncorked a Malbec to toast to the beginning of a great meal. We took turns stuffing a beautiful pacu with lemon slices and garlic, and then Francisco wrapped it in banana leaves that had been briefly softened over the flames. Our hosts buried the fish-banana bundle in the hot coals, Francis-Mallmann style, and we forgot about it and turned our attention to the next dish: humita. I’ve eaten humita as an appetizer at a restaurant or a street market, creamed corn (without meat — you might be familiar with humita’s meat-filled sister, the tamal) wrapped in corn husks. But for this version, we grated the corn, added sweet peppers, onions, and other colorful vegetables to this rendition of humita and ate it straight from the saucepan — no wrapping required. Then, our hosts dug up the fish, brushed off the ash from the fire and opened the banana leaves to reveal a buttery, lemony, garlicky beauty. 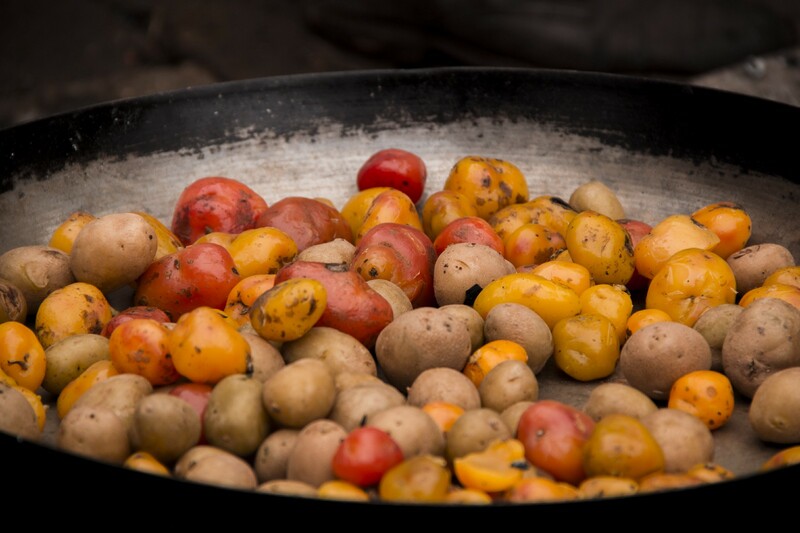 To continue the northern Argentine theme, the beef was accompanied by Andean papines, or fingerling potatoes of all different colors. “I got a woman from the central market to bring them specifically for me from Salta and Jujuy” said Franco. The natural flavors of the potatoes didn’t need enhancement apart from some coarse salt and quality olive oil as they roasted over the fire. And for the main show, after five hours of slowlyyyy roasting over the wood fire, the asado was finally ready. We devoured the juicy, tender ribs within about 10 minutes. Dessert: Buñuelos (fried dough) with carob and mint, and a mate- and citrus-infused gin and tonic. One of the other guests helped mash the yuca, and Francisco directed two of us in the preparation of a refreshing cocktail made with mate-infused gin, tonic, mint, and slices of lemon and oranges. 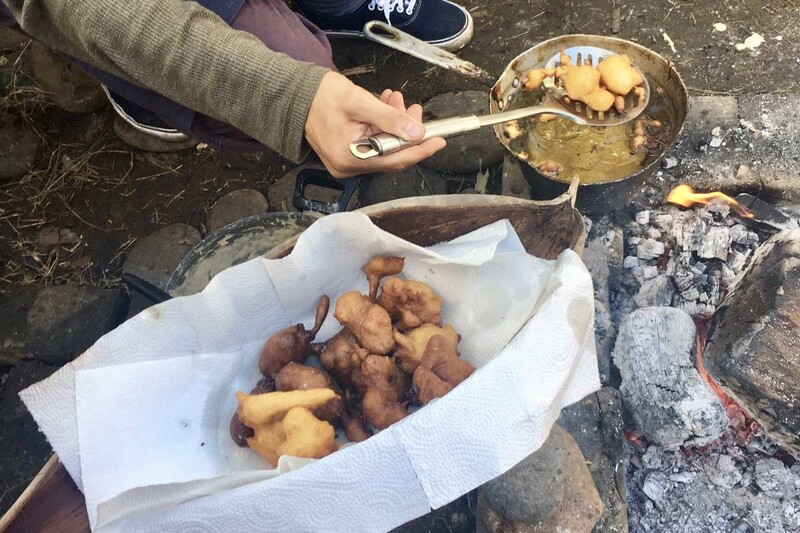 We devoured the sweet yuca dough (fried in a pot over the fire, of course) drizzled with algarrobina, a sweet, tangy, chocolatey sauce made from carob. As a finale to a beautiful day, Francisco played a few songs on his guitar next to the pool as we enjoyed our gin cocktails and nibbled on the last bits of fried dough. I knew we would eat great food, but I didn’t know to learn so much and experience so many dishes from different parts of Argentina. It almost — almost — felt like we were just a group of friends, enjoying an amazing day of cooking on a lazy Sunday. 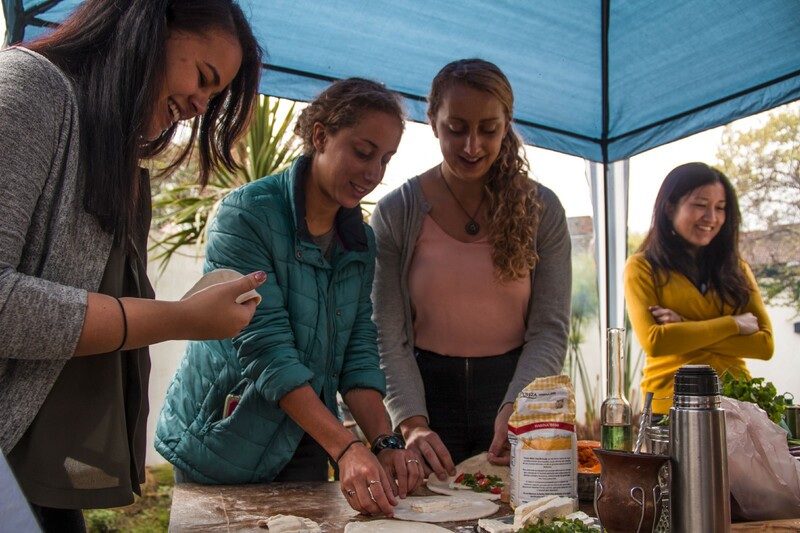 Want to be part of a cooking experience like this one? Take a look at the events available right now on TakeMeCooking.com and save your spot. Copywriter with a passion for positivity and fresh produce.